One of the newest trends that’s sweeping the nail art world is the scotch-tape manicure. “It looks good, but I don’t know how it’s done,” commented student Lily Zheng. 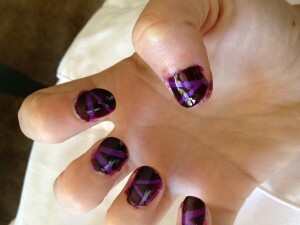 To make these designs, users take time to cut the tape into specific shapes to make designs on their nails. This type of manicure makes nails look interesting and can brighten up an old manicure. Although these manicures can take up to two hours to complete, the result is a beautiful design that everyone will want to know more about. Usually manicures are just one solid color, but as more interesting colors come out, people want to create interesting designs, such as the accent nail that many girls at Carlmont have been sporting. This trend is fairly new, but it’s slowly making its way across the Carlmont campus. The nail art world is very innovative and it looks like this could be the next big thing. Next Post Hashtags: Hot or not?